My take on Reg Baxter by his son Clive. In my opinion Reg Baxter was Hoxne's most outstanding personality of the second half of the 20th century. I know I am biased, as his son, but I think most people would agree with me. As the Rev. Tony Lowe said, at his memorial service in August 1999, he would invariably put the community before himself. Born at Downbridge Farm, Hoxne on September 13th, 1918, Reg was the only child of Eliza and Harry Baxter. 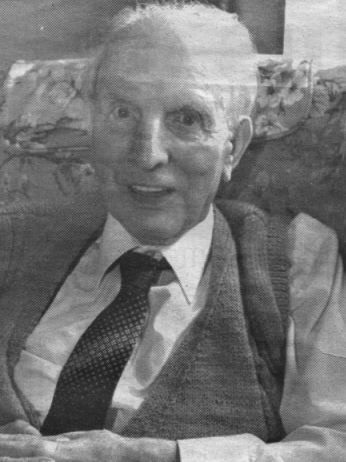 Educated at Hoxne Primary School, Reg started work with the Diss Express in 1934. Allowing for the war, he worked in Diss until May 1947, when he joined the East Anglian Daily Times, the Ipswich daily newspaper. Reg was a general newspaper reporter, covering everything from funerals to football, magistrates court cases and flower shows. Father had a year in London in 1937, when he worked for the Ilford Recorder, including covering the Mosley Riots. Dad retired on his 65th birthday in 1983. He also wrote for the Diss Express, Eastern Dairy Press and the Green 'Un and Pink 'Un sports papers. In July 1947 Reg married, Hoxne lady, Mary Quinton. Apart from the next few months spent at his mother's at 56, Low Street, Hoxne (His father had died in 1943) they lived all of their married life at 53, Low Street, Hoxne. Their only child, Clive, was born in September 1948. He married Margaret Pearl, from Worlingworth, in 1979 and they had two children, Christopher and Jasmine. Married for 52 years 4 days, Reginald died on the 30th July 1999. Dad was an outstanding character. He had loads of energy, an infectious enthusiasm and a determination to make a worthy contribution to the community. In fact it was a lifetime of service to journalism and involvement with most organisations in the village. He was a diplomat, intrinsically kind and loved being around people. A great raconteur, he had a unique style of anecdotal witty delivery. Humourous stories generally delivered with humour and wit, gentle adventurous prose, recalled with crystal clarity. He had a phenomenal recall of names. In his memory there is a plaque in the Village Hall. Also the British Legion donated a seat on which is aptly inscribed with the words "Service, not Self". Starting with a bicycle, then a motorbike, Dad took 13 tests to pass his motor car test. Dad would help anyone, from being a taxi to completing tax forms. The Royal British Legion was the cause closest to his heart. He was secretary for 50 years, receiving a National Certificate of Appreciation and was Poppy Day organiser. Dad joined the army, Suffolk Regiment, in 1939, based at Gibralter barracks in Bury St. Edmunds. The month after WW2 bega, in October 1939, Reg moved to Gloucester to join the "Green Howards". Then it was off to France. Dad was evacuated from Dunkirk. He was also in Greece (on the island of Leros, in the Aegean Sea) along with Malta. Captured in Leros, Reg was a proisoner of war in Leipzic. He made lot of friends in the army along with plenty in civilian life as well. At the end of WW2 in Europe, Reg was released with several others. Their battalion was demobed in early 1946. Although he never discussed his plan, I suspect that dad had a "vision" to get Hoxne moving again. He took a nmber of secretaryships and held them for a long period. Apart from the British Legion, he was a parish council clerk for 21 years, bowls club secretary (40 years), football club secretary (19 years) and a member of the parochial (church) council for 10 years. Also, through his and others hard work and determination, the village hall and playing field were acquired for the village. Dad served on the management committee of both the hall and the playing field. Later he would become secretary of the Mid-Suffolk Bowls Association for 30 years. Finally to Dad's sports outlook - he was a very good football player, playing at outside-left. When his playing career finished he began covering the fortunes of Stowmarket Football Club. He was also a very good bowls player, and played cricket, tennis, dominoes and shove ha'penny. He was a truely remarkable man. His legacy lives on. Picture provided by Clive Baxter.